A horse at Serenity Horse Rescue in 2013 before the raid. Serenity Horse Rescue in Ohio is closing its doors for good. The rescue’s founder, Shula Woodworth, must redistribute the charity’s assets, according to an agreement with the state’s attorney general. Just over $6,000, a horse trailer, boat, and assorted horse accessories will be redistributed to other horse rescues, including Happy Trails Animal Rescue in Ravenna. The contract also bars Woodworth from serving any Ohio charity in the future or soliciting donations. 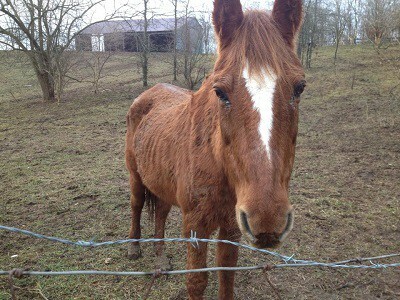 The rescue’s mission came to a halt when reports of dead horses led officials to investigate the horse rescue last year. Officials seized more than 150 animals from Woodworth’s rented property in February 2013. Included were 21 horses and various farm animals including alpacas, goats, rabbits, and pigs. Six horses were found dead on the property. It is not known how the equines died since the case is active. Woodworth pleaded not-guilty to five charges of animal cruelty. She is scheduled to be back in court later this month to change her plea, according to the prosecutor’s office.